My old favorite authors have certainly been going for the gusto. David Mitchell, William Gibson and now Haruki Murakami have all released new books recently and all three of them have gone beyond what they’ve written before. Sad to say they went somewhat beyond my most enjoyable reading. Instead of confining the sci-fi aspect to a central chapter Mitchell has spread it throughout The Bone Clocks, more intense than ever in one section. William Gibson took the “cutting edge” aspect of his techie-based sci-fi and, with The Peripheral, went to real future-fiction. The most current sections take place in the year 2050 or even later while the most distant in the far future of planet Earth. Now we have Murakami who in Colorless Turku has gone into the land of dreamy occult = ?. That’s the best phrase I can think of for what Murakami has touched on in prior books but takes to a new level in this one. This left an indelible impression on Tsukuru, compounded by a new friend doing essentially the same thing. The emotional baggage of all this affects him for many years. In the current time, 16 years after his school chums dumped him, Tsukuru meets a woman and named Sara Kimono ???. Tsukuru tells Sarah his background and she wants him to clear up the mystery of what happened to the high school friends. She thinks he has serious unresolved emotional issues. He wants this relationship to work so he sets out to find the 3 friends and the story flows from there. 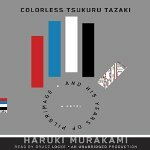 The theme of perception is always front and center with Murakami and in Colorless Tsukuru the problem is Tsukuru’s perception of himself as well as his past.